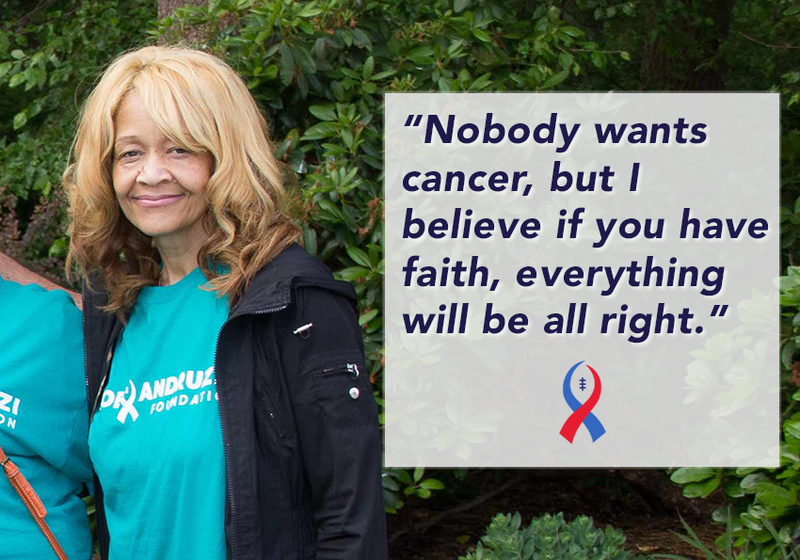 Faith and positivity are Sandra Knight’s strongest medicine. Of course, the 64-year-old mother and grandmother would wish cancer away if she could. But she doesn’t let it get her down. Sandra, who lives in Buzzards Bay, was diagnosed with cancer in various parts of her body in 2014. Her doctor sent her to colleagues at Rhode Island Hospital for treatment and she had surgery to remove her masses. But unfortunately, the cancer came back. After her Rhode Island oncologist left the hospital, she transferred to Dana Farber in Boston for additional surgery. She continues to undergo chemotherapy treatments every three weeks for two days to eradicate the cancer that lingers in numerous spots. Sandra loved her job as a social worker for homeless clients at Father Bill’s in Plymouth, and she continued to work as long as she could. But eventually, she had to go on disability when she felt too sick. She misses taking her clients to the foodbank, medical appointments and community dinners. She’s looking for something meaningful that optimizes her skills and is “not too boring,” she says, laughing. Sandra’s strong support network helps her stay positive. She has three daughters and one son, and one daughter lives nearby with her family and helps out. Her brother also lives close and she does fun things with him and his wife – like going to a Keith Sweat concert recently. Her niece came to stay and her sister often visits Martha’s Vineyard, and always invites her along. She’s also active in her church, singing in the choir, volunteering at vacation Bible school and organizing a regular women’s breakfast. She’s very proud of being a homeowner on the Cape for 25 years, and these days, she’s feeling good enough to tackle yard work and painting projects. But for many years, she was a single mom, struggling to pay the bills. And not working during cancer made finances tight. “It’s been a little challenging and my kids help me when they can,” she says. She also volunteered at JAF’s annual golf outing this past June as a way of giving back. Despite cancer and chemo, Sandra feels she’s entering a phase where she needs to get out and appreciate her life even more.